This is an 30"x30" original alcohol ink painting on a 2" claybord panel. The bubbles ebb and flow creating a serene movement within the textured hues of blue. The colors are neutral, blue, turquoise, crimson, and purple. This is an 36"x48" original watercolor and alcohol ink painting on a 2" claybord panel. It depicts patterns and shapes that remind us the intricacies of life. The colors are turquoise, crimson, teal, yellow and purple. This is an 30"x30" original watercolor and alcohol ink painting on a 2" claybord panel. The colors are vibrants and exciting as the marbles roll around the board. Each marbles represents another phase of our journey...some intertwined and some phases fading out as others come into existence. This is an 11"x14" original alcohol ink painting. It shows a close up view of a colorful butterfly while a tree lingers in the background of reds and blues. The colors are very deep and brilliant and the predominate color is red. 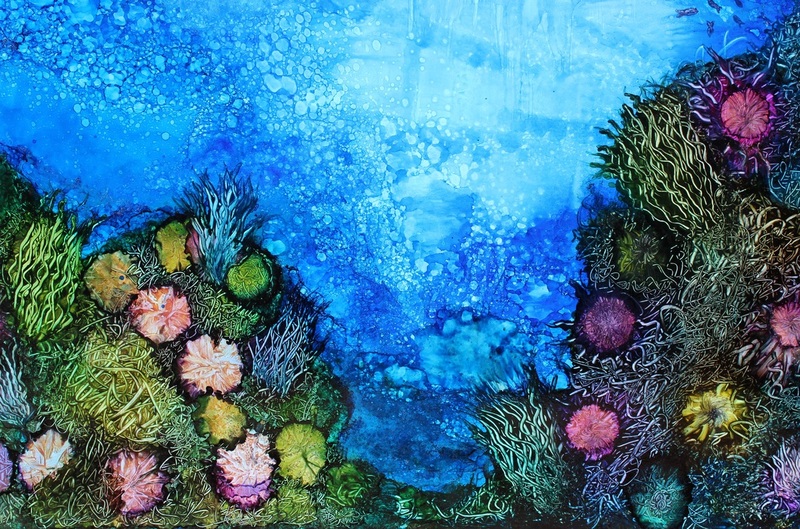 This is a 22"x28" alcohol ink painting professionally framed with a black mat and black wood frame measuring 24"x30". The glass is museum quality. It is number one in a series of three ocean paintings and is alive with color and ocean flora swaying in the waves to the music and rhythm of the sea. This is a 22"x28" alcohol ink painting professionally framed with a black mat and black wood frame measuring 24"x30". The glass is museum quality. 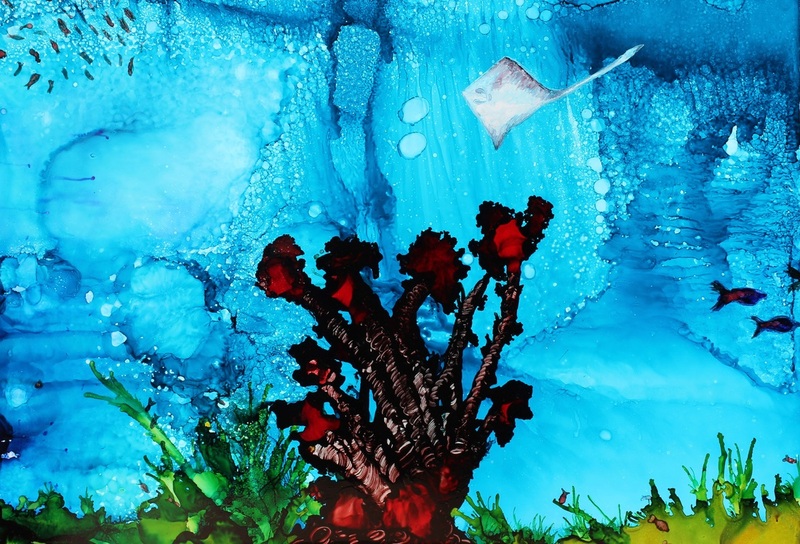 It is number two in a series of three ocean paintings and depicts a sea turtle adrift in the reef. Full of vibrant hues of blue and purple. 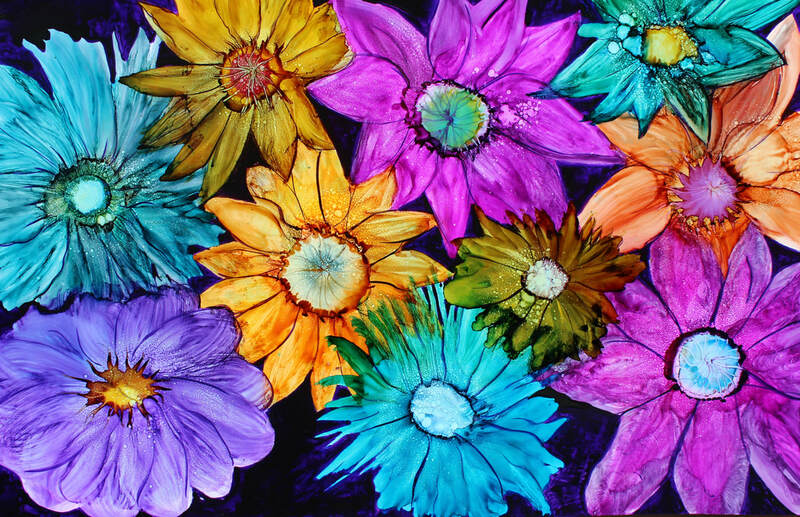 This is a 22"x28" alcohol ink painting professionally framed with a black mat and black wood frame measuring 24"x30". The glass is museum quality. It is the third in a series of three ocean paintings and shows the serenity of the ocean from the bottom of the ocean floor looking up. The sting ray and fish swim effortlessly by while the flora dances in the sand. 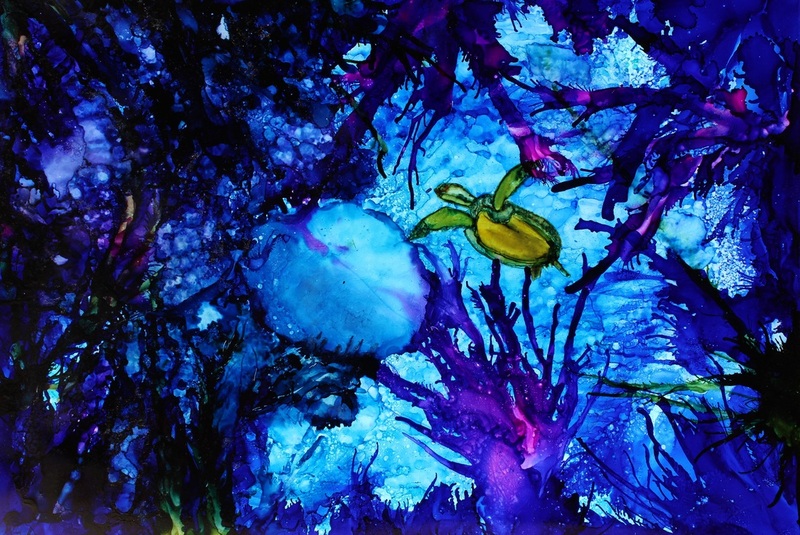 ​This is a 25" x 38" original alcohol ink painting on Yupo paper. It is professionally framed using museum glass. It is framed in a beautiful magenta metal frame that accentuates the purple background and vividness of the flowers. Additional photos are available from the artist. This is an 11x14" original alcohol ink painting on Yupo paper. It is light and colorful with blue and a yellow-green hue. It symbolizes the emotion of love and simplicity. Copyright © 2013 Sherri StewART. All rights reserved.